Well, folks we are back on Canadian soil and officially back in “canning mode”…how could we not be with the spring bounty that is ready to burst at the seams almost everywhere you turn. We were lucky enough to make it back from Vietnam in the knick of time to catch the very last of the fiddleheads. 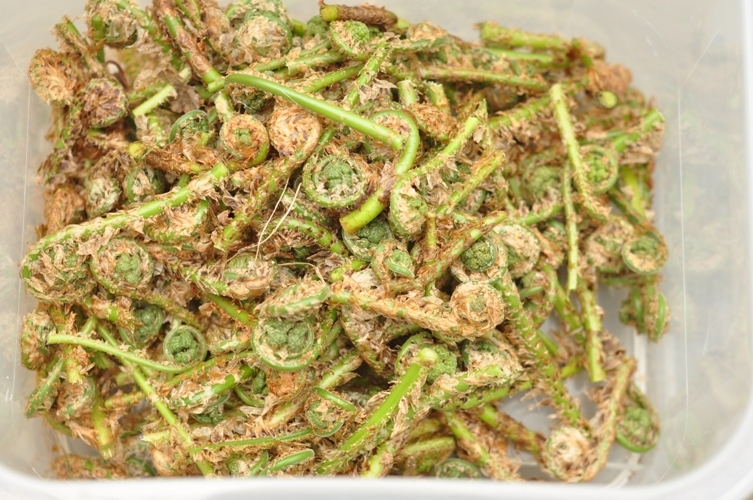 Fiddleheads are the furled fronds of young ferns and are an excellent tender veggie which can be prepared as a side dish or PICKLED to preserve and enjoy as a special treat in the months to come. Foraging for all kinds of different foods (rosehips, choke cherries, wild raspberries, milkweed pods, etc) is a passion for us. We love being outside with our dogs, in nature taking a break from the rest of the world and when you can do that and hunt for food, it’s even more fun. Living in Muskoka, ostrich ferns as well as a number of other native fern species grow wild along roadsides, in the forest, and on trails. 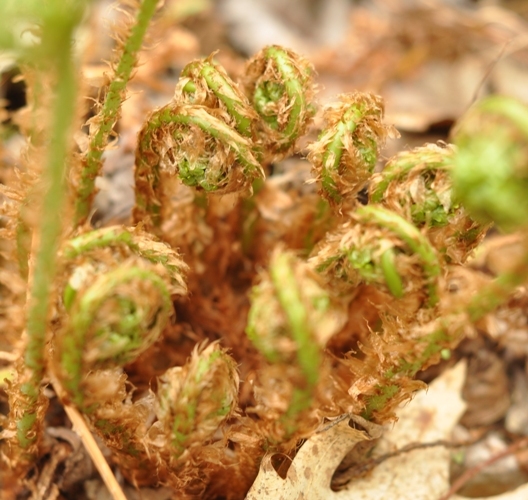 Keeping your eyes out for abundantly growing fern patches is best done all year. We note where the ferns are thickest so harvesting in the spring can be done with relative ease. It can be a time-consuming project if the ferns are too spread out or the patch is immature. Before foraging for wild foods be sure to do your homework. There is nothing worse than picking the wrong thing. Although, we will not go into great length here about which ferns are edible etc…we recommend you check out Wildwood Survival. It is an interesting site with great photos and information about the appropriate ferns to harvest. Also, remember the importance of sustainable harvesting and never pick more that three fiddleheads per plant. Each fern produces about 7 fronds and over harvesting will kill the plant. 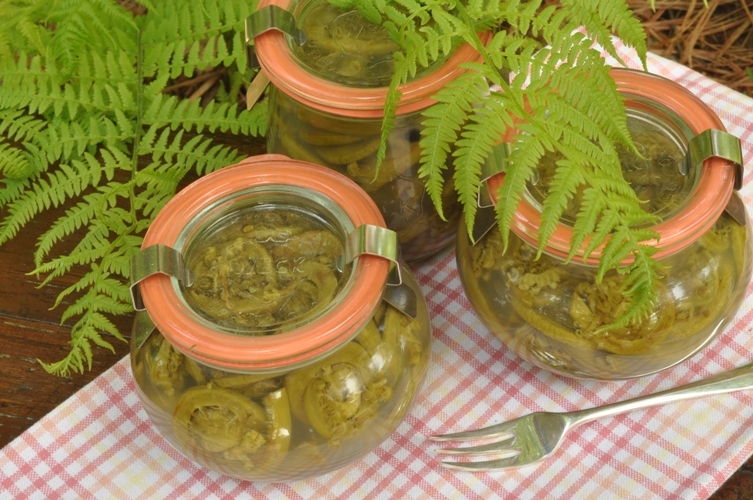 But, if foraging is not your thing and you still want to try making this very unique and delicious pickle don’t worry. 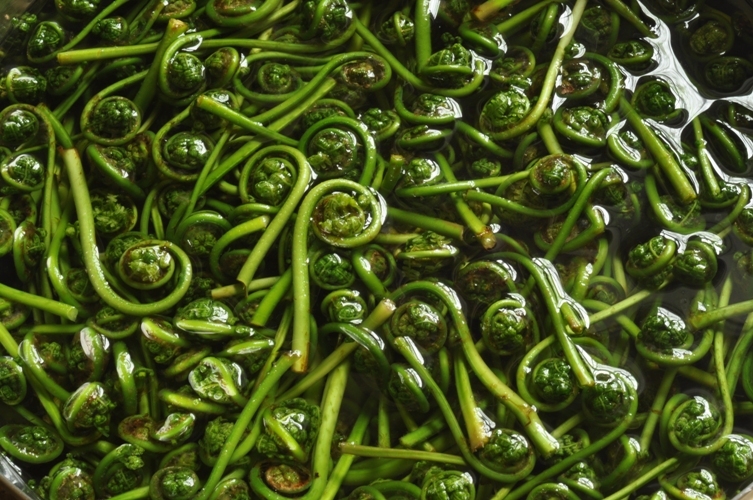 Most of you will be able to find fiddleheads at your local farmers’ markets or even in the grocery store. The nice thing about the ones you buy is that the brown paper like coating has been washed away and they just need a quick rinse to be ready to go. The foraged fiddleheads require quite a bit of washing to remove this paper wrapper before being able to eat, cook, or preserve. That being said, we still love to forage and the time spent together with our dogs in the forest is time well spent! Prepare for water-bath canning. Note: we sterilize our jars in the oven at 250F for 30 minutes. Mix all ingredients well (except fiddleheads). Remove lid, let jars stand in the hot water bath for 5 minutes, remove jars, check seals, label, and store. Great post Matt and Andrea!!!! Sounds like foraging is really great fun and time well spent. I can’t believe you’re back already. Did that seem fast? So how do you eat the preserves? Yeah, back to the cooler temps. The heat there was unbelievable!! We have tons of foodie photos from our trip…too many! It seems we ate our way through Vietnam. 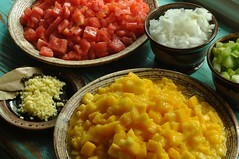 One of our favorite restaurants in Hanoi was Highway 4…everything on the menu was super good. Yesterday, saw Bizarre Foods Vietnam episode and there Andrew was at Highway 4…kind of cool. We tried crickets roasted in pig fat…mmmmMMMMgood and tons of other interesting bites (frogs legs, pigeon, chicken cartilage). If you want anything for your new website let us know. As for the fiddleheads, we just eat them on there own. I bet you can come up with something more creative than that! ?